Explore a futuristic universe where robots take the forefront and plunge you into a post-apocalyptic world of the unknown. Today, we’re happy to announce the third art book of the ArtStation Media collection, Dreaming in Mech: The Art of Nivanh Chanthara. Nivanh Chanthara has lived and breathed concept design for more than 20 years. A lifelong passion for mechs and dedication to his craft has fuelled his journey from graffiti artist to designer of iconic creations in TV, game and film. Dreaming in Mech: The Art of Nivanh Chanthara presents a remarkable body of work exploring mech, cyborg and vehicle designs from sketches to finished concepts, and reveals Nivanh’s creative strategies in a series of illustration and photobash breakdowns. For the first time, you can now preorder the book and be one of the first to get it in your hands before the global release. Preorders are only available to customers with a shipping address in the United States and Canada. International shipping will be available via Amazon at the time of the book’s global release in early April. 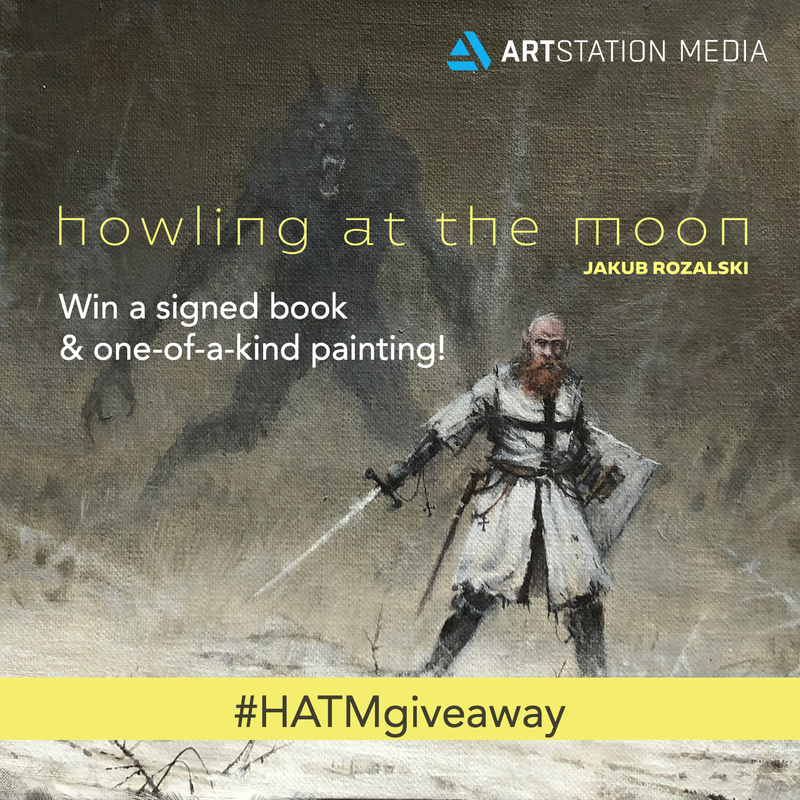 Win a one-of-a-kind acrylic painting and signed copy of Howling at the Moon from Jakub Rozalski! 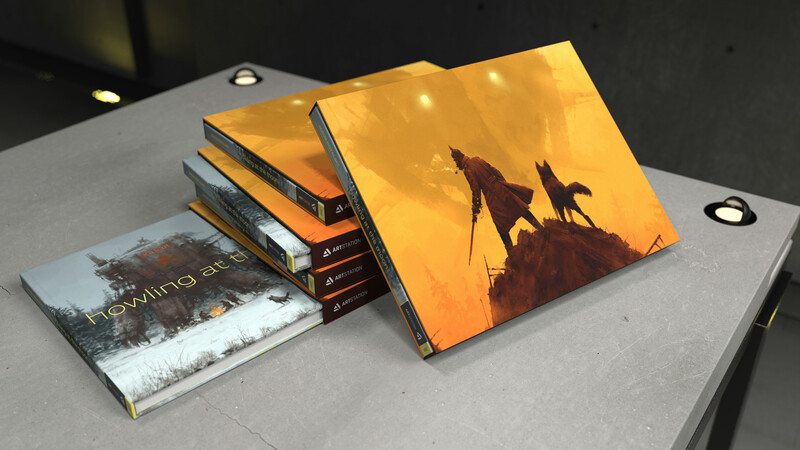 Back in March, we published our second art book, Howling at the Moon with Polish artist, Jakub Rozalski. While most of the artwork he published on his ArtStation Page is digital, he is also a talented traditional painter and he collaborated with us to offer a very rare giveaway. On Instagram, we’re giving you the chance to win an exclusive signed copy of Howling at the Moon and a special one-of-a-kind acrylic painting by Jakub himself. Repost the contest image on your Instagram page using the tags #HATMGiveaway and #ArtStationHQ. The winner will be randomly selected and announced on June 18. Jakub Rozalski, is a Polish artist best known for his World of 1920+ series, an alternate 20th century European history that combines war and the industrial revolution with mech robots and folklore. His worked served as the basis for the popular board game Scythe, the Iron Harvest video game Kickstarter and several unreleased projects to come. Inspired by his surroundings on the Polish countryside, his work captures the nostalgic atmosphere in rural landscapes while incorperating colossal giants, ominous machines, werewolves and lonely wanderers. For the first time, Rozalski gave us an exclusive sneak peek into his world and shared some of the stories and sceneries that inspire his work. See the full post here. Discover more of Jakub‘s work in Howling at the Moon, available on Amazon. We are delighted to finally announce the second edition of the ArtStation Media collection, Howling at the Moon by famed Polish concept artist, Jakub Rozalski. Be transported into mysterious worlds where history, folklore, and modernity harmoniously clash and discover the book today! The book features a collection of Rozalski’s work from his World of 1920+, Wolfpack1863, the Ancients, Apocalypse day and folk stories. Complete with step-by-step tutorials, English an Polish commentary from the artist and an exclusive interview, you’re sure to get lost in its pages for hours. The book’s special edition includes a hardcover slipcase and an envelope of 6 exclusive prints. Director and Designer Brent Ashe has crafted every aspect of Howling at the Moon’s presentation to make it an art experience you’ll love. On November 8, we celebrated the launch of the first edition of the new publishing division with Martin Deschambault’s long awaited Project 77. “We’re just so excited to be creating these beautiful art books that brings ArtStation onto people’s bookcases. It’s just cool,” said CEO Leonard Teo on why ArtStation was starting to go into the publishing business. “Working with the brilliant Martin Deschambault, legendary designer Brent Ashe and veteran production designer Daniel Cox has set the bar incredibly high for the ArtStation imprint—which is exactly where we like it,” added Co-Publisher Daniel Wade, who produced 40+ art books at Ballistic Publishing (founded by Leonard in 2003). Project 77, though still not available for purchase on Amazon, was on sale exclusively at the event where guests were able to mingle and their book signed by the guest of honour. One lucky guest won a signed Project 77 canvas to bring home with them. Project 77 is scheduled to be available online through Amazon towards the end of November. Sign up for the ArtStation Media newsletter to receive notice when the you can order your own copy!